"The Course in Blues Guitar That Shows How To Play Classic Acoustic Blues"
"I don't think you should have to pay a lot of money to get the best acoustic blues guitar lessons - these video lessons show anyone how to apply everything learned over the past 40 years by a working blues man - everything you need learn to play old style blues guitar is here." "Find Out What Over 10 000 Existing Students Already Know ..."
... anyone Can Learn Acoustic Blues Guitar Using My Award-Winning Teaching Method! From Delta bottleneck to Piedmont Ragtime - all finger picking techniques in one package, so no need to shop around all over the internet. Jim was voted Top Internet Guitar Instructor by users of Truefire.com 2013, because his students learned the real blues fast. You will receive the lessons streamed online - delivery is optimized for all devices. “ Jim has some great lessons here - step by step so you can take your time to get things right. He breaks down every part of the songs into bit-sized chunks that are easier to learn. PDF downoads, and bonuses. ... they are better than any of the YouTube acoustic blues lessons that are teasers for professional videos that I've seen (and this includes some of the major finger style publications). I find that your method, thoroughness, quality, and personable style not to mention the sheer bulk of songs make your package incredible value. At last, you can learn the authentic tricks used by the classic blues men. Streamed Access immediately after payment. BONUS #1 Jim's MP3 album 'Metro'. No Gimmicks, Tricks or Fine Print. I’ll refund your money immediately if you’re unhappy. Jim Bruce is "The Man"
I've done loads of guitar tutorials in my time, and Jim's recording method and instruction is by far the best I've seen! Downloads plus PDF tab files - can't be bad! The format Jim Bruce uses is like sitting in your living room and having a good friend show you lick by lick how to play a song. This is how I learned to play many years ago, as I expect many of you did, too. The tabs are simple and accurate, and he combines them with close ups of the left and right hands so there is no guessing. And the songs are classics, a very nice study of fingerstyle blues. Thanks, Jim. I have been playing fingerstyle guitar for years. I signed up for this class already knowing some of the songs, but wanting different twists. I have been most pleasantly rewarded. Jim's approach has improved my playing, and his breaks are a welcome addition. I find that I take his input, mix it up a bit with my own style, and end up sounding better. A highly recommended course for seasoned players, and likely a godsend for those who haven't played much at all. thanks! We are so lucky to have the guidence from Jim to learn this old style of music. He gives us the foundation needed to play ragtime. I am thankful for his blind blake lesson collection, he teaches complete complicated songs from start to finish and breaks it down making learning easier. Go Jim! Highly recommended! Jim Bruce not only succeeds in making you sharing his love of blues by his simplicity and obvious kindness but teaches you as well the accurate technics of the old masters of blues. He makes you discover some bluesmen who have unfortunately not the fame they deserve and show you how exactly they played. A great player and a great teacher. This man loves the guitar and the music it makes. Breaking the licks down to easily learned sections will let you learn to play the music you love better than ever. It has for me. Keep teachin' that pickin' Jim. You truly are the man. Jim is a great teacher. Straightforward, clear and clearly passionate about the blues. The lessons are well tabbed and essy to follow. Jim often gives alternative versions or licks - ones he plays on the street which are also helpful in finding other ways to play the song. Great value. Great course! The Brits have had a long love affair with American blues. As a lifelong resident of Chicago, I was startled to discover in the 60s at 13 years of age the music I was listening to from England (primarily electric blues as played by Peter Green, Jeremy Spencer and Eric Clapton) was originally from my hometown, albeit the "other side of the tracks." Jim clearly has a love affair with all forms of acoustic blues, and it shows with these easy to follow transcriptions. I only wish they were also transcribed into standard notation as well as the tab he provides. A small nit, but don't let it stop you from making the investment in his course. It's worth every penny. The tune selection is extensive and outstanding. Thanks for keeping indigenous American music alive Jim. Thanks Jim,for putting this course together. I have purchased several ,guitar instructional dvd's and your course is the best. Really like the way you explain each bar and lick and the singing really helps on the timing. 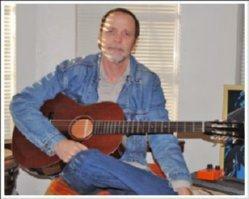 Thanks Jim for a comprehensive learning tool to study acoustic blues guitar. Awesome range of material to choose from. Good instruction and well broken down to easy to learn sections. Good examples of how the songs should sound - and obviously a seasoned performer. This is for the intermediate player though, but if you know your basic chords and are prepared to put the effort in, I'm sure you will get there. Video is polished and while not shot in a studio, is very good. Easy to see everything he does. If you only learn one song from this course it is money well spent, but I'm sure if you get this, you will learn more than one song. It's not what you play but how you play it. And here you learn how to play it right. I've seen finger style guitar made to hard by many teachers, but this course gets you playing and doesn't leave you frustrated because you will get results and have fun. Playing acoustic fingerpicking ragtime/ blues guitar is most likely the most gratifying of all guitar styles I have actually ever learnt how to play. The fullness of the sound seems like 2 guitars playing together and is something that's difficult to beat. Ragtime and blues fingerstyle is first of all not as difficult to play as it sounds. A lot of the appeal of fingerstyle blues (particularly ragtime) can be more of an acoustic impression than actual notes being played - there's not as much going on as your ears would have you think! The very best way to discover this playing technique is to simply leap right in and explore some tunes. This it not something for the total novice, but if you are at an intermediate phase of guitar playing then you ought to be more than capable of playing acoustic blues. As long as you can easily play typical chord shapes and rhythms fairly well, then that ought to be all you require, together with string the desire to practice and find out just how to do it right. When I initially got into blues finger picking, there wasn't much readily available in terms of videos revealing these 'secrets'. I discovered the music by listening along with a couple of tabs from books. The most significant difficulty I had with this was (apart from being slower than tuition from video) where to put your fingers on the fretting hand. The thing that grabbed my attention was that Jim's lessons looked like a real quality guitar course. This is something you hardly ever discover when stumbling throughout the typical costly downloadable offers for learning blues guitar, something of which there is no lack of regrettably! Unusually in the world of online guitar tutorials, you are really getting exactly what you pay for ... great one Jim! Exactly what do you get? The course includes 39 downloadable videos (good for Windows or Mac), every one revealing a complete fingerstyle tune separated and ordered into phrases revealing left and picking hand close ups. Jim likewise discusses how each tune is played in addition to pointers where extra detail is needed. Each video is accompanied by a dowbloadable pdf TAB file in addition to the chord shapes, and tabs are also being shown on screen in the video. The tunes taught span the work of artists such as Robert Johnson to Blind Blake covering basic tunings, open G tunes and also open D (DADGAD). There's adequate coverage of the numerous blues techniques and styles from the bouncy ragtime feel of Blind Blake to the more standard blues work of Lightnin' Hopkins and Floyd Council. In general, Jim's course is among the very best downloadable guitar - and I've been round the block a few times! Not just do you get many hours worth of videos revealing you the best ways to play all the tunes, but also high quality guitar tuition for a guitar style that's not that common at this quality. Many other downloadable courses are merely reworked material priced at 3 times their real worth. Jim provides a no-questions fast refund if you aren't delighted with his blues lesson videos, personally I can't see that he gets lots of disappointed clients. As sales are managed through robust digital download providers, you can feel confident your infomation and payment details are protected and safe. Jim's course is going to be difficult to beat and I'm more than pleased to recommend it, if you want the best take on to take on fingerstyle blues guitar. Simply plain straight talking "how to play fingerstyle blues guitar". you'll be refunded, no questions asked!